Building upon the foundation laid by the full-size, over-the-ear Momentum headphones that was released into the market last year, Sennheiser recently have launched the brand new on-ear version of Momentum and it is now available right here in Malaysia. With a headband that is made from stainless steel, the new on-ear Momentum headphones still maintain the same overall design from the original over-the-ear Momentum headphones although the new on-ear version is slightly smaller in size. Additionally, Sennheiser also utilizes Alcantara – a suede-like material that is widely used in automotive industry – instead of leather for the on-ear Momentum’s earpads. Apart from two special foams that are fitted into its earpads for extra comfort, the ear cups on the on-ear Momentum headphones also come with stainless steel sliders so that users are able to adjust the headphones’ fit to their liking easily. To complete the premium look of the headphones, Sennheiser have also bundled a detachable cable with integrated controller and microphone made out of metal together with it. The new on-ear Sennheiser Momentum headphones is also equipped with the company’s proprietary 18-ohm transducer which translates into output that the company described as “rich, detailed, and with a slight bass emphasis”. 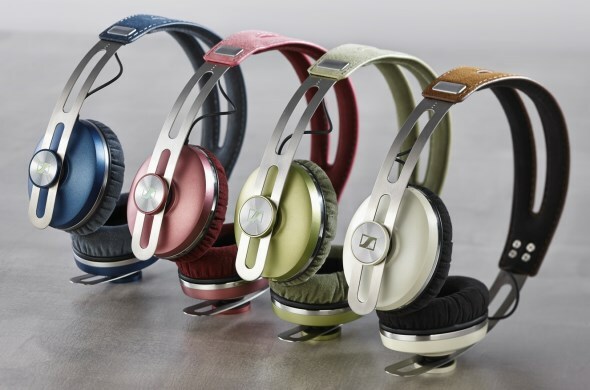 Priced at RM 809, the headphones can be obtained in blue, green, pink and ivory over at authorized retailers and selected Sennheiser partner stores right away. To learn more, check out the new headphones over at www.sennheiserasia.com.